Eating disorders manifest themselves in all sorts of ways — overeating, purging, anorexia, over exercising, and obsessive, self-sabotaging thoughts — and affect many more Americans than are officially diagnosed, most doctors believe. Besides the very serious physical effects of eating disorders, which can sometimes lead to starvation and death, the emotional and psychological issues that individuals with eating disorders face can be so damaging that leading a normal life is nearly impossible. If you’re trying to pull yourself out of a confusing battle with self-control, body dysmorphia and the guilt and shame that accompanies eating disorders — or if you’re a doctor or family member wanting to learn more about healthy treatment options— pick up one or a few of these books for support. Find guides, workbooks, and informative manuals on anorexia, bulimia, and overeating. Eating in the Light of the Moon: How Women Can Transform Their Relationship with Food Through Myths, Metaphors, and Storytelling, by Anita A. Johnson Ph.D.: Be your own counselor when you read this book to help you develop a healthier relationship with food and eating by considering certain metaphors and understanding your feelings. Life Without Ed: How One Woman Declared Independence from Her Eating Disorder and How You Can Too, by Thom Rutledge and Jenni Schaefer: A psychotherapist (Rutledge) and his Nashville personality patient (Schaefer) write about binging and purging, body issues, and gaining control over Ed. Starved: Mercy for Eating Disorders by Nancy Alcorn: Nancy Alcorn’s Christian-based Mercy Ministries helps thousands of women conquer eating disorders, and this book offers tips for recognizing and overcoming them. Lying in Weight: The Hidden Epidemic of Eating Disorders in Adult Women by Trisha Gura: Gura maintains that doctors often dismiss eating disorder symptoms in women over the age of 25 as being attributed to another condition, and here she offers help to adult women who still need it. Beating Ana: How to Outsmart Your Eating Disorder and Take Your Life Back by Shannon Cutts: The author struggled with an eating disorder for 15 years but is now supporting other men and women as they make the decision to face their disorders alongside friends and family. Regaining Your Self: Breaking Free From the Eating Disorder Identity: A Bold New Approach by Ira M. Sacker and Sheila Buff: Dr. Sacker — who has 35 years of experience in eating disorder treatment — is a well-respected expert whose 2007 book is already being used over and over to supplement therapy. I’m Beautiful? Why Can’t I See It? : Daily Encouragement to Promote Healthy Eating & Positive Self-Esteem by Kimberly Davidson: There are a lot of underlying factors that can inspire eating disorders, and self-esteem and body images issues are just two of them. This book follows a 13-week plan to help boost self-esteem and destroy unhealthy thoughts. Breaking Free from Emotional Eating by Geneen Roth: Roth helps overeaters fight the "food is love" complex in this book. The Rules of "Normal" Eating: A Commonsense Approach for Dieters, Overeaters, Undereaters, Emotional Eaters, and Everyone in Between! by Karen R. Koenig: This guide to healthy eating was written to enlighten all kinds of individuals about food relationships. The Food and Feelings Workbook: A Full Course Meal on Emotional Health by Karen R. Koenig: This book is full of questionnaires and experiential exercises that help the reader deal with emotional issues food relationships, and their overall self-esteem. Intuitive Eating: A Revolutionary Program That Works by Evelyn Tribole and Elyse Resch: Tribole and Resch are nutritionists who help overeaters forget about dieting and separate their feelings from their food. Eating Disorders: The Journey to Recovery Workbook by Laura J. Goodman and Mona Villapiano: This book is designed to supplement one-on-one or group therapy, and was written by two clinicians. Overcoming Bulimia: Your Comprehensive, Step-By-Step Guide to Recovery by Randi E. McCabe, Ph.D., Traci L. McFarlane, Ph.D, Marion P. Olmstead, Ph.D: Designed to help each reader break down their disease and find their own customized path to recovery, this book has been well-reviewed by individuals struggling with bulimia. 50 Ways to Soothe Yourself Without Food by Susan Albers: Discover exercises, mind tricks and inspirational thoughts to soothe yourself when you’re stressed, instead of overeating. Life Beyond Your Eating Disorder: Reclaim Yourself, Regain Your Health, Recover for Good by Johanna S. Kandel: This personal guide to healthy, positive living helps those with eating disorders and other self worth issues is written by a woman who struggled with anorexia and bulimia herself. It’s Not About the Weight: Attacking Eating Disorders from the Inside Out by Susan Mendelsohn PsyD: Clinical psychologist Dr. Susan J. Mendelsohn also suffered from an eating disorder, and here she offers practical, effective tips for dealing with body image issues and obsessive thoughts. What’s Eating You? : A Workbook for Teens With Anorexia, Bulimia, and Other Eating Disorders by Tammy Nelson: First discover the triggers and motivations behind your eating disorder behaviors, and then learn how to redefine your relationship with food and yourself. 100 Q&A About Eating Disorders by Carolyn Costin: Parents and family members, doctors, friends and those with eating disorders can learn more about eating disorder treatment, variations, psychological effects, triggers, and more. Shrink Yourself: Break Free from Emotional Eating Forever by Roger Gould: Gould helps overeaters understand where their "hunger" comes from, and how to wean themselves off of eating for comfort. These novels serve as an indirect method for easing into the idea of treatment and therapy. Unwell by Leslie Lipton: Positively reviewed by the CEO of the National Eating Disorders Association, Unwell follows the day-to-day life of a young girl with anorexia nervosa, starting from her first triggers and symptoms. Feeling for Bones: Sixteen-year-old Olivia struggles to love herself in this novel laced with Christian values. Second Star to the Right by Deborah Hautzig: This young adult novel is crippled with fear of failing in virtually every aspect of her life, and turns to anorexia for comfort. These first-hand accounts from individuals who overcame severe eating disorders can offer you support, inspire courage, and help you understand that you can overcome your disease. Thin Enough: My Spiritual Journey Through the Living Death of an Eating Disorder by Sheryl Cruse: Find out what it’s like to wake up early enough to fit in six hours of exercise and subsisting on diet soda and cough drops for "food." Gaining: The Truth About Life After Eating Disorders by Aimee Liu: Liu’s book combines personal stories involving her mid-life relapse with anorexia, interviews with other people who have eating disorders, research, and her beliefs about how eating disorders manifest. Wasted: A Memoir of Anorexia and Bulimia by Marya Hornbacher: Hornbacher’s disorder started as a desire to just lose a few pounds, but landed her in mental hospitals. Next to Nothing: A Firsthand Account of One Teenager’s Experience with an Eating Disorder by Carrie Arnold and B. Timothy Walsh: Carrie Arnold shares her story about how she almost died from a struggle with anorexia, what led her to treatment, and how she recovered. 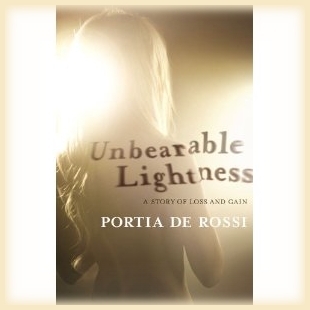 Unbearable Lightness: A Story of Loss and Gain by Portia de Rossi: Actress Portia de Rossi shares the graphic, painful day-to-day struggle she endured for years because of a severe eating disorder. Bulimics and Bulimia by Maria Stavrou: This book is a collection of stories from girls and women who struggle with bulimia. Good Eater: The True Story of One Man’s Struggle With Binge Eating Disorder by Ron Saxen: While women are often thought of as the only gender that suffers from eating disorders, men are also diagnosed with anorexia and bulimia. Saxen’s book tells his story of how his ambitions of becoming a model were hindered by an eating disorder. Purge: Rehab Diaries by Nicole Johns: Johns shares her experience in therapy and a treatment center that helped her overcome purging and anorexia. Room to Grow: An Appetite for Life by Tracey Gold and Julie McCarron: Actress Tracey Gold discusses the pressure to be thin as a young star and the eating disorder that got out of control, without losing her humor or commitment to helping teen girls. Diary of an Eating Disorder: A Mother and Daughter Share Their Healing Journey by Chelsea Smith: Described as "raw" and "honest," Smith’s account of a mother-daughter relationship strained by an eating disorder may offer support and inspiration for other families. Learning to Be Me: My Twenty-Three-Year Battle with Bulimia by Jocelyn Golden: After two decades of dealing with bulimia, Tracey Golden finally overcame her disorder and bravely writes about her journey here. Locked Up for Eating Too Much: The Diary of a Food Addict in Rehab by Debbie Danowski Ph.D.: Danowski talks about her six-week treatment program for food addiction. Read these books to learn more about the motivations and struggles your loved one is going through, and how you can help. Help Your Teenager Beat an Eating Disorder by James Lock, MD, Ph.D. and Daniel Le Grange, Ph.D.: Lock and Le Grange believe that eating disorders can sometimes be attributed to genetics and character traits, and in this book, they help parents identify red flags and understand the dark behaviors and consequences of eating disorders. When Your Child Has an Eating Disorder: A Step-By-Step Workbook for Parents and Other Caregivers by Abigail H. Natenshon: Natenshon has been featured on Oprah for her expertise in dealing with young people and eating disorders, and this book comes with a workbook to guide parents along the treatment path. Surviving an Eating Disorder, Third Edition: Strategies for Family and Friends by Michele Siegel, Judith Brisman and Margot Weinshel: This book, first published in 1988, has been updated to help today’s families deal with eating disorders. Eating with Your Anorexic: How My Child Recovered Through Family-Based Treatment and Yours Can Too by Laura Collins: This book describes the controversial Maudsley Approach to treating eating disorders, which focuses on family therapy. The Parent’s Guide to Eating Disorders: Supporting Self-Esteem, Healthy Eating, and Positive Body Image at Home by Marcia Herrin: Before — or instead of — going to hospitals for treatment, Herrin suggests families start treatment at home by examining their own relationships and approach to food and body image. Talking to Eating Disorders: Simple Ways to Support Someone With Anorexia, Bulimia, Binge Eating, Or Body Image Issues by Jeanne Albronda Heaton, PhD and Claudia J. Strauss: Find out how you should first react when you realize your child has an eating disorder, and when to seek medical treatment. Anatomy of a Food Addiction: The Brain Chemistry of Overeating: An Effective Program to Overcome Compulsive Eating by Anne Katherine: Families and friends can read this book to more fully understand why their loved one is bingeing, and it’s also been ready by compulsive eaters looking for support. Doctors, counselors and other professionals can read these books to learn how to help patients with eating disorders. What Every Therapist Needs to Know about Treating Eating and Weight Issues by Karen R. Koenig: General practitioner therapists can learn more about the physical and emotional issues at hand when treating a patient with an eating disorder. The Oxford Handbook of Eating Disorders Edited by W. Stewart Agras, M.D. : Besides learning about the different kinds of eating disorders — and their motivations, psychological effects and behavioral characteristics — you’ll also keep up with the latest research and treatment ideas. Eating Disorders: Time For Change: Plans, Strategies, and Worksheets by Mona Villapiano and Laura J. Goodman: This resource for therapists contains tools, strategies and tips for maximizing therapy sessions. The Eating Disorders Sourcebook: A Comprehensive Guide to the Causes, Treatments, and Prevention of Eating Disorders, by Carolyn Costin: By reading this book, you’ll be better prepared to identify eating disorders inpatients and design a rehabilitating treatment option for individuals, too. Cognitive Behavior Therapy and Eating Disorders, by Christopher G. Fairburn: Fairburn explains specific eating disorder treatment strategies using cognitive behavior therapy here. Dialectical Behavior Therapy for Binge Eating and Bulimia by Debra L. Safer, Christy F. Telch, Eunice Y. Chen and Marsha M. Linehan: Veteran doctors and those new to DBT will find easy-to-follow guidance for treating eating disorders according to this method. Eating Disorders: A Guide to Medical Care and Complications by Philip S. Mehler MD CEDS and Arnold E. Andersen MD: This is a treatment guide for doctors who encounter patients who are too physically ill to undergo mental health evaluation in the beginning stages of rehabilitation. Assessment of Eating Disorders by James E. Mitchell, MD, PhD; Carol B. Peterson: Researchers and clinical caregivers can read this book to learn more about the different methods and technologies for identifying and treating eating disorders. This entry was posted on Wednesday, November 24th, 2010 at 10:21 pm	and is filed under Health Tools. You can follow any responses to this entry through the RSS 2.0 feed. You can leave a response, or trackback from your own site.